Early last Friday, John and I packed up the car and headed to New York City for the weekend. 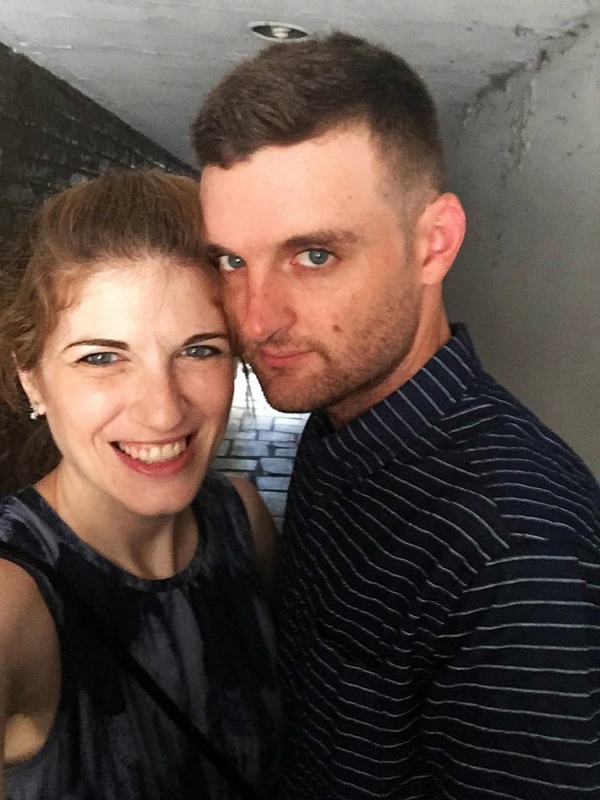 Normally when I say that, what I really mean is Brooklyn, because that’s where a good chunk of our best friends and John’s brother relocated to (what felt like) en-masse five years ago, but this time our destination was truly Manhattan proper. Why? Airbnb, baby. Because we were taking the trip together (we both visit often, but usually separately), renting an apartment through Airbnb let us indulge in a little tourist action while simultaneously sparing our loved ones the joys of having to rearrange their compact NYC apartments for us (not that they wouldn’t have). Emboldened by the arrangement, we didn’t even stick with the original plan of driving to New Haven and then taking the train into the city. We (and by that I mean John) just drove straight in and parked in a garage a few blocks away from where we’d be staying in the East Village. As always, we had an awesome visit. Here are 10 photos to sum it up, though I should warn you that most were taken with my phone. Oh, well. While we waited to get inside the apartment on Friday afternoon (which ended up being fantastic), we got lunch at Otto’s Tacos — mostly because it was right there and looked good, and it was. Homemade corn tortillas and fresh salsas? Yup. 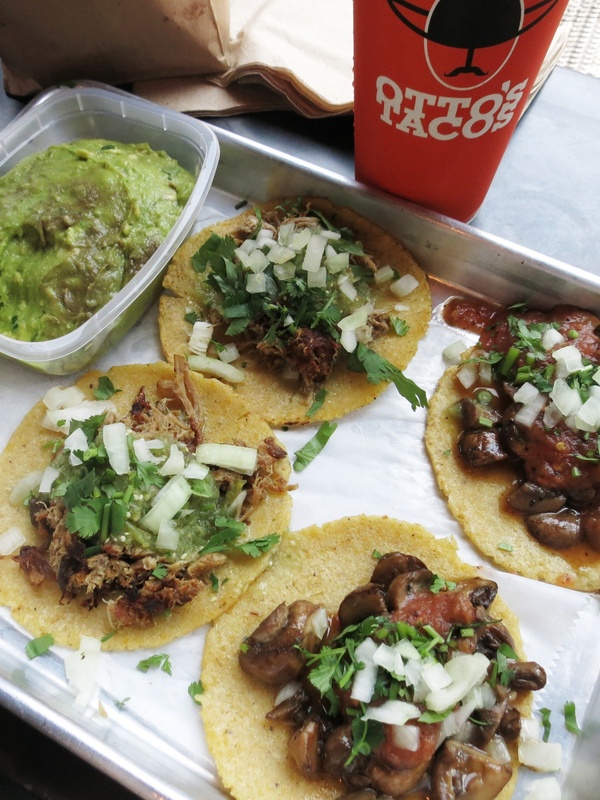 Carnitas Tacos and Mushroom Tacos from (wait for it) Otto’s Tacos. After getting settled, we sucked it up and made our way to lower Manhattan to visit the National September 11 Memorial and Museum. 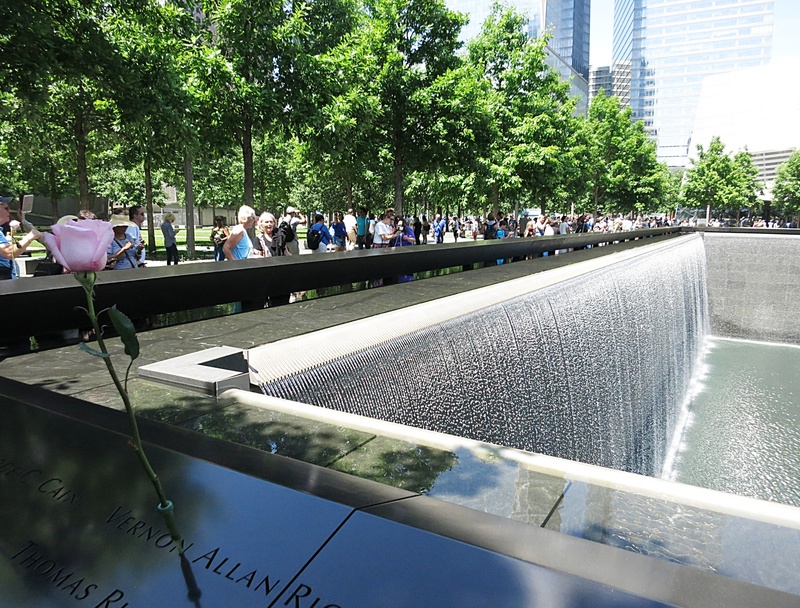 The site includes a (free) outdoor park memorial with two reflecting pools in the footprints of the original Twin Towers, and a massive underground museum. 60 Minutes has done a number of wonderful segments on the museum coming together over the years and John and I both knew we wanted to see it. As you’d expect, the experience was incredible, paying tribute to both the events of 9/11 (nearly 14 years ago — can you believe it!?) and the many ways that we’ve tried to process and understand what happened since then (and still are, and always will be). I was moved to tears several times, especially in the In Memoriam section, where color photos of the nearly 3,000 victims fill the walls while touch screens allow you pull up individual profiles by tapping faces or typing names. 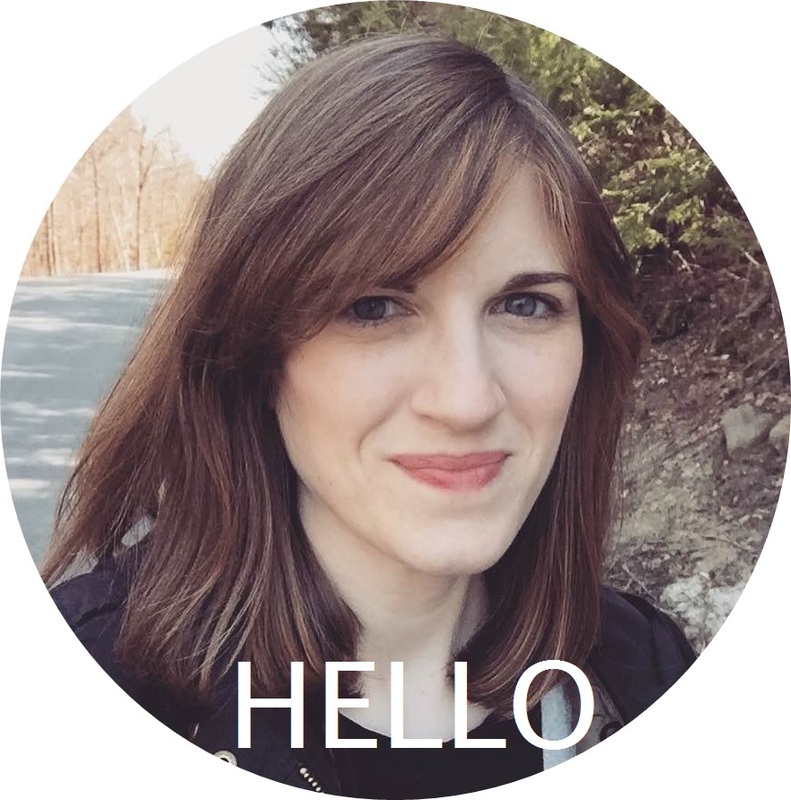 Included in the profile are candid photos and personal recorded testimonials that offer a heartbreaking look at who they were and what they valued and enjoyed in life…what was taken away from them. It’s hard to not think about the ripples spreading out from each face — the staggering number of lives changed. It’s a difficult place, but it’s supposed to be. I encourage you to see it if you haven’t, but I’m sure you didn’t need me to tell you that. One of the two reflecting pools in the footprints of the old Twin Towers at the National September 11 Memorial. 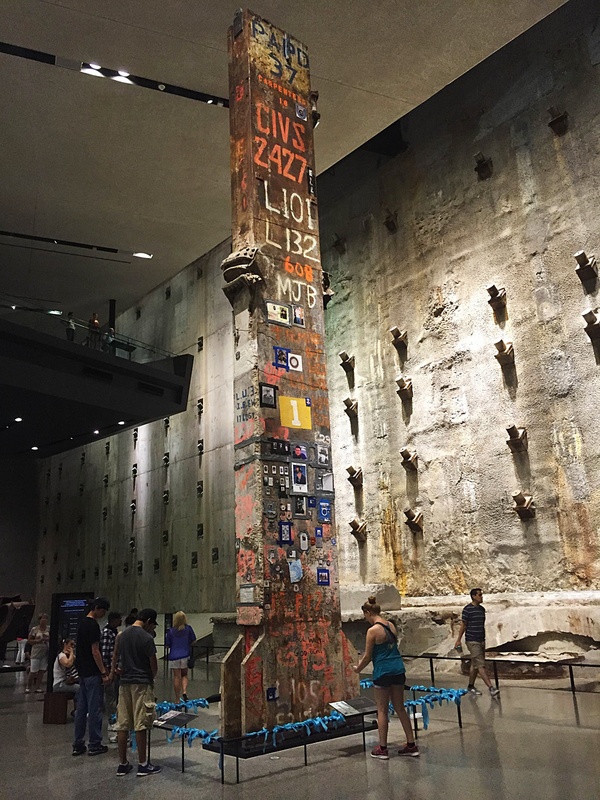 The famous “Last Column” is now in the underground Main Hall of the National September 11 Museum. The museum opened in May, 2014. Later, ready for a change of pace, we met up with our friends for a delicious a dinner followed by copious merriment. It was a very fun evening, though I think we may have overdone it. Maybe that’s what happens when you only see each other together a few times a year — if that. 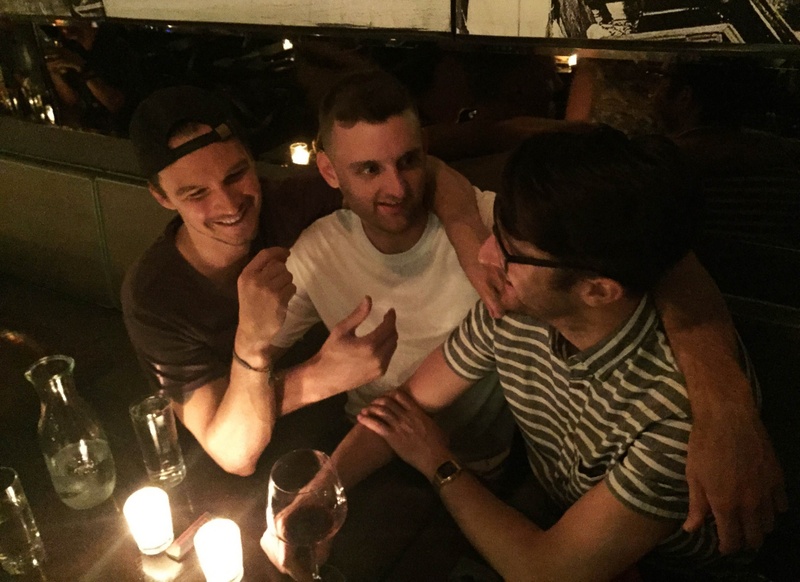 John with the two Matt’s. Lifelong friend on the left, brother on the right. Scenes like this make my heart very happy. 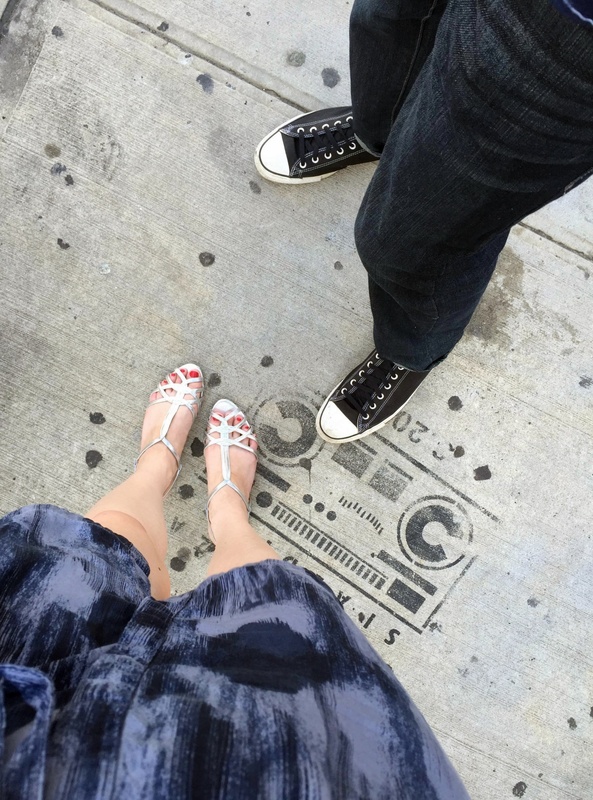 In the morning, John and I walked over to Cafe Orlin for brunch. A Bloody Mary, I can assure you, was necessary. We actually liked this place so much we went back again on Sunday morning (I know, so bad, but it was so good we couldn’t help it) before the long drive home. 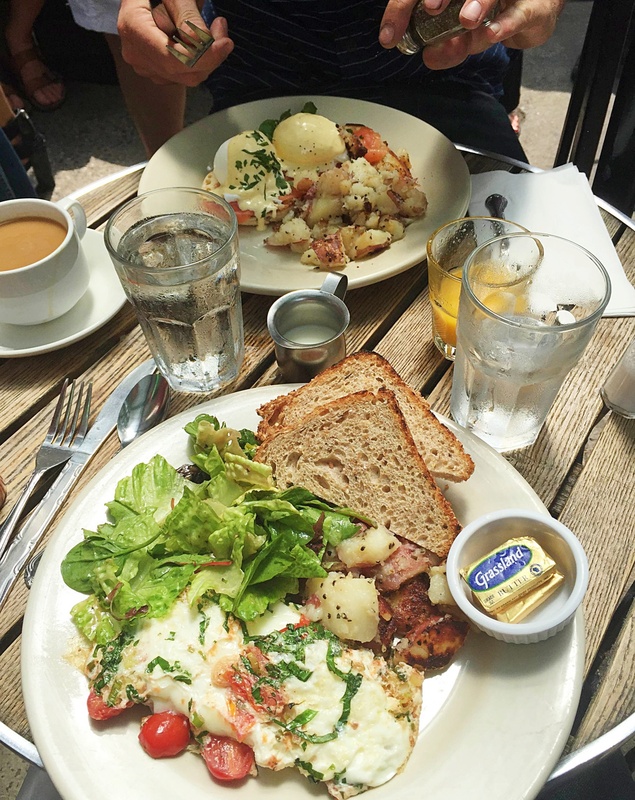 This photo is from Sunday — I had the Tomato-Basil Egg White Omelet and John had the Norwegian Eggs Benedict, which was smoked salmon instead of Canadian Bacon. Food! Brunch at Cafe Orlin in the East Village. Full and happy, we strolled over to Washington Square Park in Greenwich Village. I’d never been there before, so I definitely had to indulge my inner Sally Albright at the Arch. 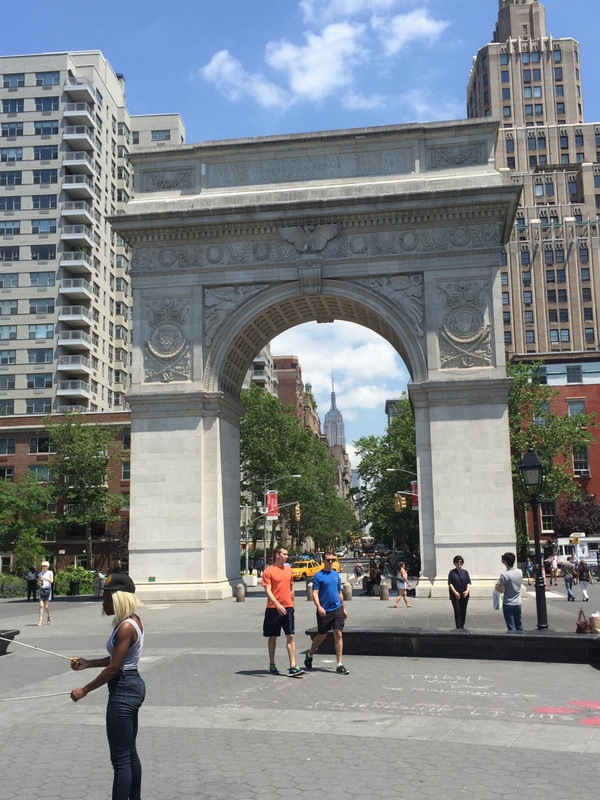 The Empire State Building visible through the Washington Square Arch in Washington Square Park in Greenwich Village in Manhattan in New York City. There may have also been some peer-pressure Double Dutch. It turns out that John and I make pretty willing tourists. How ’bout that? John’s brother Matt had invited a group of friends over to dinner at his apartment that night in Queens, but we decided to make our way to Brooklyn first, where Melissa still lives. Before heading down into the subway, though, I insisted on getting a smoothie at Liquiteria. I have recently gotten into making smoothies at home for breakfast, and couldn’t resist stopping, since I heard theirs were “pretty good” (and, of course, it was). Bostonians, take note! They’re adding a Harvard Square location this summer. 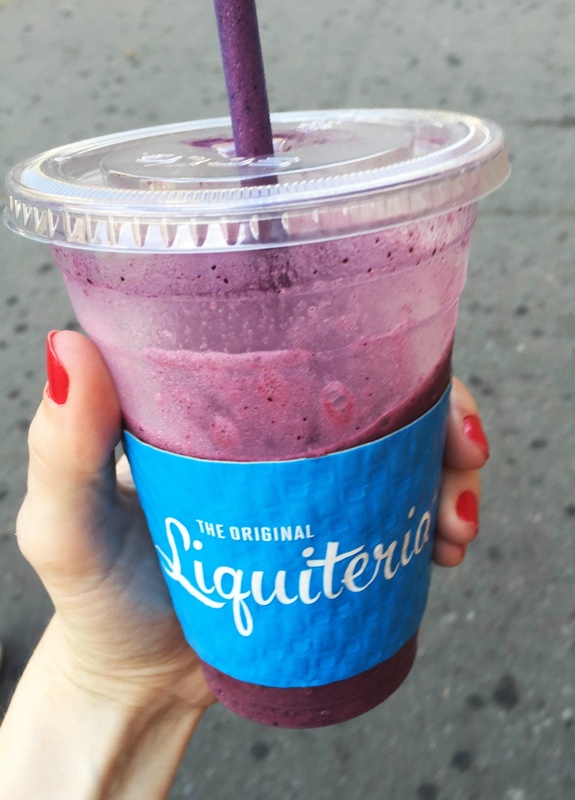 Berry Powerful smoothie from Liquiteria. From Where I Stand, the Brooklyn edition, while consulting phones. 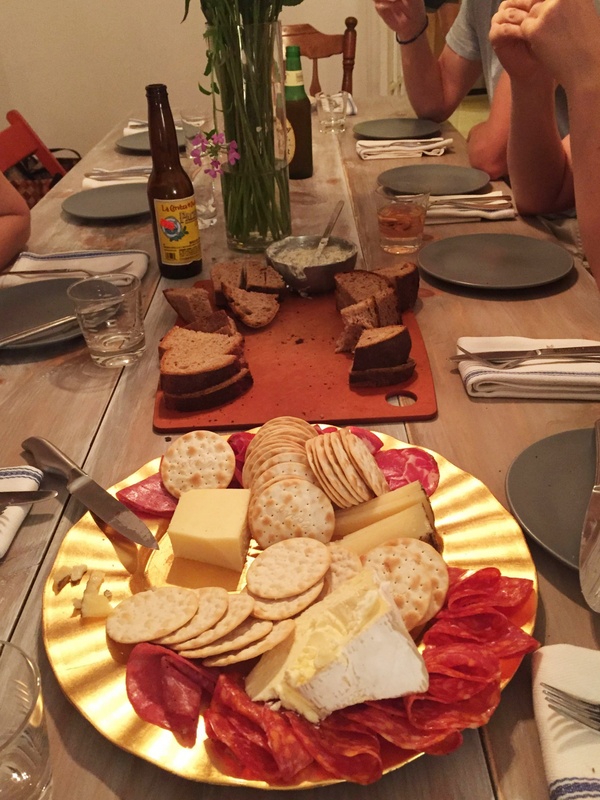 And then it was time for a dinner party! I only took a photo of the appetizer swooping stage, but everything was delicious and we had a great time. How could we not? Dinner party swooping. Cheese plate, homemade bread, and the host’s fantastic tzatziki. The inevitable conversation about home invasions. Paula Abdul’s “Straight Up,” which holds up better than I would have thought. Me seeing and wanting to pet stray cats. I loved every second. Thanks for a great weekend, friends! Sounds like you had a great time! I had a great time reading all about it. Would like to go to the 9/11 museum someday too. Such a sad moment in our history…..